Beggs, Alexandra (Sandra) nee Dempster, passed away suddenly 7th November 2018 at Antrim Area Hospital, late of Carrickfergus. Wife of the late Gordon, much loved mother of Russell and Janeen, mother in law to Paul, devoted nan and great nan and sister of Donna and the late CJ. A service of thanksgiving will be held on Monday 12 November 2018 at 11am in Mulhollands of Carrickfergus, 39-41 Irish Quarter South, Carrickfergus BT38 8BH after which Sandra will be laid to rest at Victoria Cemetery. Family flowers only. 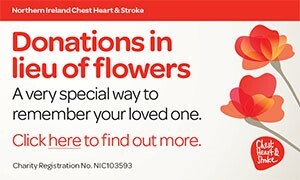 Donations in lieu of flowers, if desired, payable directly to Autism NI, Knockbracken Healthcare Park, Saintfield Road, Belfast BT8 8BH. Hope you are at peace. I am sorry to tell you that Alexandra (Sandra) Beggs has passed away.